Part 5: Off-Season Periodization, cont. The Triathlete Strength Training PrimerPart 5: Off-Season Periodization, cont. Last week we dove into the process of setting up a periodized strength training program for the off-season of a triathlete. We introduced Joe Friel’s concept of utilizing both a General and a Specific Preparation Period, and discussed how we can adapt it to our strength training programs. Let’s dig a little deeper down the rabbit hole that is sport performance training. Your last race of the season was 2-4 weeks ago… You did well, but missed your goal time by 3 minutes. You’re endurance was on point, but you just didn’t have the leg strength to cruise up the hills or keep a strong pace during the last couple of miles in the run. You know you can do better and after reading the past 4 parts of this series, you’re convinced taking an intelligent approach to strength and conditioning is what has been holding you back. It’s time to get serious this off-season. Part 4 introduced the Gen. Prep. Period, and gave a framework on how to approach training during this time. We want to be focus on developing muscular strength and anaerobic power, preferably in muscle groups that we use while cycling, running, and swimming. The unique aspect of the swim portion is the fact that you can use your arms to propel you through the water. A triathlete with a strong pull can easily navigate the swim while saving their legs for upcoming bike and run legs. Picking weighted pull-ups and row variations will help us build a strong shoulder girdle and upper back that is crucial to developing a strong freestyle. A pull-up motion is very similar to the pull in freestyle, so this exercise will have tons of carry-over to performance. The forward lean during the saddle-position in cycling shifts most of the work to our hamstring and quadriceps. This prods us to pick knee-dominant lower body movements. You may be tempted to choose a Bulgarian Split Squat with a “short” stance to really nail the quads one at a time in order to be bike-specific, but remember, this is the General Preparation phase, and we really want to focus on building as much strength as possible. A better choice would be the high-bar back squat or the front squat. These options allow for heavier loads to be used, and therefore more gains in absolute strength, while also requiring a more up-right torso angle and less glute involvement. The front squat and high-bar back squat would also be great choices to build leg strength specific to running. This improves the value of these exercises as we can use them in order to build leg strength for both sports. Running involves more hip extension then cycling does however, so we want to also pick a movement that will help us build strength in our hip extensors (hamstring and glutes). Both deadlifts and back-elevated glute bridges would serve well in this department. Once we reach the Special Preparation Period, we’ll want to move the bulk of our strength work towards single-leg variations in increase specificity and build more run-specific strength. 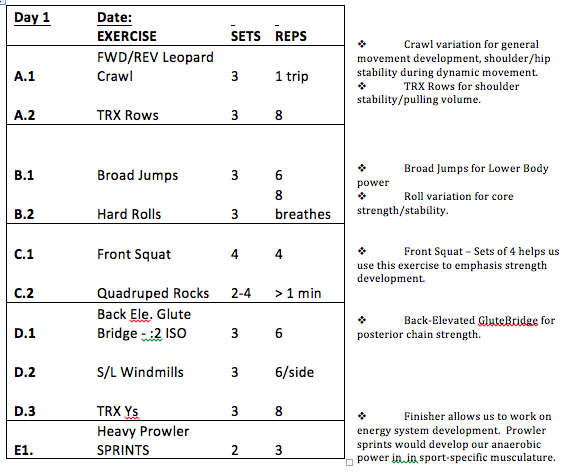 Below is a sample week of strength-focused training for the General Preparation Period of a triathlete. Next lets take a look at what a week of training would look like during the “Special Preparation Period.” Remember, we are starting to get more sport-specific during this phase and our conditioning focus will shift from increasing our anaerobic power to increasing our anaerobic capacity. As we get closer and closer to our season, we want to shift our training focus away from developing general adaptations and become more methodical and specific. We need to start programming exercises that will have more direct carryover to our sport, in this case, swimming, biking, and running. The Special Prep week that is posted above would occur pretty early on in that phase. As we near the end of this phase, we would want to shift our conditioning focus to developing aerobic fitness and our strength work would be more focused on slow-twitch hypertrophy. This means utilizing methods such as HICT Step-Ups or the 2-0-2 Tempo Method for strength work. Always remember, each and every training program you write should be tailored towards the individual athlete. The corrective drills in the example weeks above are specific to that particular individual’s goals and needs, so a program suited for you may look drastically different in terms of exercise selection. As always, thanks for reading and be sure to post and questions or comments in the section below. Stay tuned for Part 6 next week and keep Tri-ing! !